So you think Valentine's Day is just another overblown commercial American Hallmark import, designed to separate you from your money? "It's like Halloween," you say, "...we don’t do that here". Well dude, we have news for you: it's not about you. Many men seem to think that if they find Valentine’s Day clichéd, schmaltzy or downright embarrassing, then their woman must be of the same mind. I've yet to meet a woman who isn't moved by sentimental Valentine's tales of true and lasting love (click here). 1) Does she watch bonnet dramas? 2) Has she at any point in her life, kept a diary? 3) Does she send Christmas cards, birthday cards or otherwise use snail-mail for anything other than business or when being sued? 4) Was she born after 1965? 5) Does she have a pulse (even a faint one)? If the answer is “yes” to any of the above – you have a sentimental gal on your hands. So time to overcome your squeamishness. Think of it as a women’s holiday - Romantic Gesture Appreciation Day, much like sporting events are de-facto men’s holidays (can I get a Grand Final anyone?). Or perhaps think of Valentine's Day for women as being kind of like Santa is for kids. Yes, it's not something you believe in, but it puts a smile on someone else's face. So this afternoon, get those flowers, or maybe a book; chocolates - hell yeah, they're good for our mood; or even a just a magazine she likes and a bottle of something. And no, it doesn't have to be clichéd, or prescribed by American movies. No skywriting required. It’s nice to do something sweet for your loved one. The best relationship advice we’ve heard is - who cares, wins - meaning, if she’s into it, just do it. Got it guys? So cough up. Girls, what do you think? Do you agree or do you think I’m talking out of my hoo-hah? 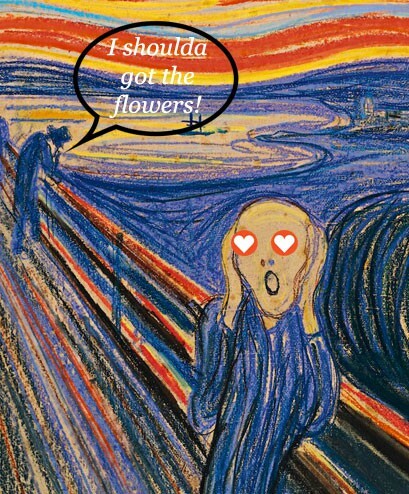 Would you secretly (or not so secretly) like to get the hearts and flowers treatment today?